while we relax on aussie boxing day, it is weird for me to think that it is still christmas day back home in canada. we had such a lovely day yesterday, probably the best christmas that i've had in years and years. kids really do make the holidays so much more fun. and it is amazing what i can get done in an hour of kid free time these days. shane took both kids with him to pick up his sister across town and i managed to get the turkey stuffed and in the oven, vaccumed the whole house and brought out all the presents to open when they got back. 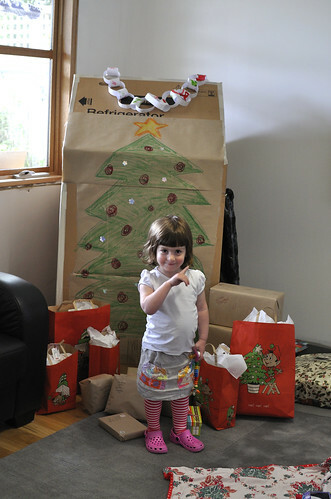 piling the gifts in the middle of the room just seemed wrong so i grabbed some kraft paper and crayons and hastily got to work on a last minute tree for them to discover when they got home. oh that tree is lovely.